NATURAL We believe in the superior qualities of natural fibres. Italian linen suiting and pure linen shirts. Cotton shirting, chinos, shorts and jersey casuals. Blends of wool, cotton and cashmere for our country jackets. Breathable merino and warm lambswool knitwear. Fine silk formal ties and pocket squares. Leather in many finishes for our shoes and belts. HERITAGE We use many traditional British suppliers with centuries of expertise and knowledge between them. Our Yorkshire suppliers include Abraham Moon for our sports jacket fabric, Alfred Brown for our blazer cloth and Z Hinchliffe & Sons for our lambswool yarn. CRAFT Every piece in our collection is crafted to exacting standards, from the working button cuffs on our tailored jackets, to the traditional construction of our shirts and the extra detailing on our casualwear. CARE We offer hassle-free 60 day returns and have a friendly in-house customer service team with extensive product knowledge to help you with your order. Pure Italian linen paired with classic tailoring, makes for perfect smartcasual attire. Available as a suit or separates. 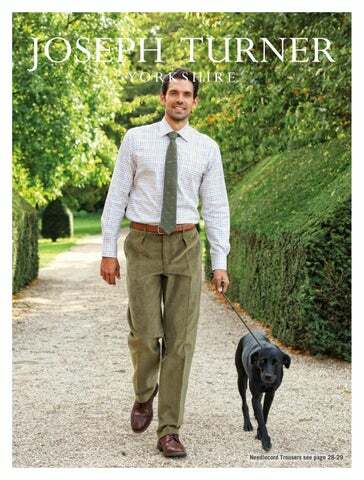 For trouser and jacket sizes see page 82. Stay smart as the temperature rises in short sleeves with neat turn ups and a handy breast pocket. For shirt sizing see page 82. Blue Herringbone Shirt MSHWBL Floral Printed Silk Tie MAT533 Silver Bike Cufflinks MACBIC For shirt sizing see page 82. Blue Gingham Shirt MSGIBL Motif Woven Silk Tie MAT481 Union Flag Cufflinks MACUJF For shirt sizing see page 82. £270.00 OFFER £216.00 • 100% wool woven in the UK by Alfred Brown, Yorkshire • Available as a six button double breasted jacket or two button single breasted jacket • Traditional brass buttons • Two straight pockets with flaps (double breasted) • Two slanted pockets with flaps (single breasted) • Two inside pockets plus pen & ticket pocket • Twin back vent & working button cuffs • Professional dry clean only For jacket sizing see page 82. • 100% cotton twill, woven in Italy • Two button single breasted jacket • Two straight pockets with flaps, two inside pockets plus pen & ticket pocket • Twin back vent & working button cuffs • Professional dry clean only For jacket sizing see page 82. Woven by Abraham Moon in Yorkshire using a blend of wool and linen to produce the perfect weight of fabric for warmer months. Blue Windowpane Available in Brown/Red Check & Blue Windowpane • 50% wool 50% linen blend woven in the UK by Abraham Moon, Yorkshire • Two button single breasted jacket with two straight pockets with flaps • Two inside pockets plus pen & ticket pocket • Twin back vent & working button cuffs • Professional dry clean only • Available in 15 chest and length combinations	For jacket sizing see page 82. Tailored from soft brushed cotton twill, our heritage Tattersall checks draw on decades of horse racing tradition in Thirsk. COUNTRY SHIRTS £82.00 OFFER £65.60 COUNTRY TIES £59.00 OFFER £47.20 Country Shirts • 100% pure brushed cotton • Classic fit & collar shape • Twin-button cuffs • Breast pocket as standard • Two-piece collar & split back yoke • Traditional gussets & lock-stitched buttons • Country Ties 100% silk For shirt sizing see page 82. Country Shirts • 100% pure brushed cotton • Classic fit & collar shape • Twin-button cuffs • Breast pocket as standard • Two-piece collar & split back yoke • Traditional gussets & lock-stitched buttons • Country Ties 100% silk For shirt sizing see page 82. A true country essential, our high quality polar fleece has smart contrast trims, leather zip tabs and checked detailing. COVERDALE GILET MOFLGT £89.00 OFFER £71.20 COVERDALE JACKET MOFLJA £99.00 OFFER £79.20 • Mid weight polar fleece • Adjustable drawcord at hem • Zip pockets & elasticated cuffs (jacket) • Contrast brushed cotton trim inside back neck • 100% polyester • Machine washable at 40ºc To fit chest sizes (inches): M 37-40 L 41-44 XL 45-48 XXL 49-52 Both styles are available in all colours. A lighter alternative to our best-selling heavy winter cords, with the same rich depth of colour, soft feel and comfortable fit. MRNCOR £96.00 OFFER £76.80 Available in Straw, Olive and Navy. •	100% European cotton 11-wale needlecord (midweight 270g) •	Single forward pleats at front •	Side pockets & two rear pockets with button fastening • Zip fly • Machine washable (inside out) at 40°C For trouser sizing see page 82. Z Hinchliffe and Sons have been spinning lambswool in Yorkshire for over 200 years. Their use of superior raw materials and traditional techniques create a signature texture and warmth. Soft cotton casuals featuring modern prints in classic colours. Soft, laundered, pure cotton. The essential summer trouser. • 100% washed cotton twill • Classic cut • Side pockets & one rear pocket with button fastening • Pleat front chinos have single reverse pleats • Zip fly • Machine washable at 40°c Both styles are available in all colours. For trouser sizing see page 82. Excellent cut, fit and material. Instantly soft and relaxed with a beautiful natural texture. Our best-selling pure linen shirts will keep you cool, fresh and looking effortlessly stylish in the heat. Thoroughly recommended. The colours are always lovely. Three classic shades with button tabs for rolled up sleeves and two buttondown breast pockets. J EA NS Canvas, Denim or Twill, all our jeans are classic cut and comfort-fit. For jean sizing see page 82. Classic sportswear styling in soft cotton jersey featuring a contrast placket, side pockets, twill taping details and a zip through front with leather tab. Specially treated cotton polo with extra strength and lustre, for a smarter look. Go bold & bright with our essential polo selection. Vibrant stripes in 100% soft cotton jersey. Add a pop of seaside colour with tropical foliage and geometric prints. Travel in style with a British made Chapman holdall. Dyed and bonded waterproof cotton canvas, complemented by leather details and solid brass hardware. For over 150 years Loakes have been making shoes in Kettering where they are still based today. SHIRT SIZES (inches) SLEEVE 33"
S H IRT F IT T I N G GU I DE Collar - Measure around your neck where the shirt collar would normally sit, allowing room for one or two ﬁngers to be inserted between the tape measure and your neck depending on how loose you like to wear your collar. Sleeve - Take one of your well-ﬁtting shirts and, with the back facing you, measure from the centre of the collar to the shoulder seam and along the sleeve to the end of the cuff. For the most accurate measurement ask someone else to measure you whilst you are wearing the shirt. Alterations - Please allow an extra 14 days for delivery for any shirts ordered with either of the below alterations. £9 Sleeve Shortening - If you require a shorter sleeve length please let us know and provide your preferred length to the nearest half inch. The most we can shorten sleeves by is 3 inches and we cannot exchange or refund shirts that have had their sleeves shortened. £5 Breast Pockets - Our classic formal shirts come as standard without a pocket, please let us know if you would like a pocket adding. Cuffs - All our formal shirts are offered with either single button or double cuffs for cufﬂinks. Our country and casual shirts have button cuffs as standard. F O OTW E A R When buying any of our footwear please be sure to try them for size on a carpet so that, should you need to return or exchange them they are in as new condition and in their original packaging. We cannot accept footwear back where either the soles or upper are marked in any way, unless they are inherently faulty. 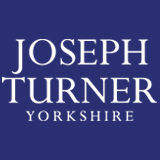 If you are not 100% satisﬁed with any item from Joseph Turner you can simply return it within 60 days (7 days for Clearance department items) and we will be happy to exchange the item, or provide you with a full refund. Please note that we cannot exchange or refund clothes or footwear which have been washed or worn except for the purpose of being tried on for size, or items that have been altered, unless they are inherently faulty. If you are returning goods that you bought using a discount or offer and the return causes you to fall below the offer threshold, then we will adjust the refund accordingly. Please note that postage costs will not be refunded. 1. Fill in the returns form that appears on the back of your invoice which was included in the parcel we sent you. 2. Attach the sticky freepost returns label (supplied with your order) to your parcel. 3. Take it to the Post Ofﬁce. Please ensure that you get a free proof of postage receipt as the parcel is your responsibility until it reaches us. Our catalogue is recyclable and biodegradable.